This snakey little fish comes from Indonesia and the Malay Peninsula. They live in clumps of plants located in streams. They usually inhabit these clumps with many others of their own kind. 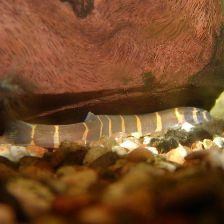 These Loaches require areas where they can burrow such as under dense plant cover and driftwood. Use fine gravel or sand for your substrate. You also must have excellent filtration because these little guys are very sensitive to bad water quality. This is a generally peaceful scavenger fish. They love to be kept with their own species in groups of five or more. Smaller groups become extremely shy. They get along well with other peaceful species in a community tank. Larger fish will eat these little aquatic snacks, so don't throw them in an aquarium with aggressive Cichlids. The males are fatter along their backs. Females are fatter along their bellies. Males also have larger and more paddle shaped pectoral fins. Kuhli Loaches are mainly a nocturnal scavenger but they will sometimes dart out to grab uneaten food during feeding time when the lights are on. They tend to burrow under decor and plants because they are very shy. Keeping them in a good sized group may allow you to see some of them more often during the daytime. The best way to breed these fish is to put several in a breeding tank with an undergravel filter. Don't put any other fish in with them. Be sure to have fine gravel substrate and small clumps of rooted plants around the bottom of the aquarium. They will also require exquisite water quality. Do daily 10% water changes and do not vacuum the gravel. During the spawining, feed them crushed pellets and flake food. Be very careful not to over feed them. It may take awhile for you to see their offspring. Just be patient and wait them out, taking care to do your daily water changes. For more information, go to Wikipedia's Kuhli Loach page.